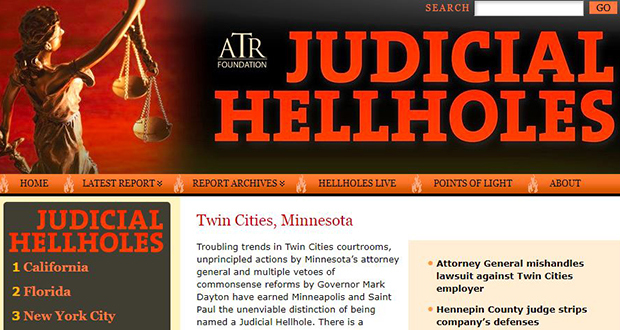 The Twin Cities is an official Judicial Hellhole. That may or may not be a bad thing. It was awarded this approbation/stigma by the American Tort Reform Association, which has been naming names since 2002. We are ninth on a list of nine, and this is our first year on the list. California is at the top. The ATRF’s mission is “to shine a light on imbalances in the courts and thereby encourage positive changes by the judges themselves and, when needed, through legislative action or popular referenda,” according to its recent report. It does not like to see states attempting to expand civil liability. The report is available at http://www.judicialhellholes.org. Minnesota AG’s mishandling of groundwater contamination case, particularly the payment of $125 million in attorney fees to an out-of-state law firm. Hennepin County trial court Judge Amy Dawson hands down unwarranted sanctions. This was the case that resulted in a $15 million verdict against BNSF, along with other fines, attorney’s fees, and costs. The case, Kowalewski v. BNSF Railway Company, is on appeal. Governor Mark Dayton’s ‘veto triple play.’ Bar Buzz thinks its readers are familiar with this saga. State high court restricts liability protection for property owners. In Ouradnik v. Ouradnik, the landowner was denied recreational-use immunity for an injury suffered by his son while hunting on the property. Minnesota Supreme Court rejects Daubert. Last month the Supreme Court rejected a proposed amendment to the rules of evidence, which “solidifies Minnesota’s position as an outlier in its approach to evaluating the admissibility of expert testimony,” the report states.